Looking over the edge of a vertical cliff get ready to shout, 'ON RAPPEL!' Join up to nine other fellow adventurers on a six hour tour into the heart of an Arizona high country canyon. This 'choose your way' adventure will have you wading through a pine forest, rock hopping down a slippery wet wonderland, swimming under waterfalls, leaping into deep pools, sliding down natural waterslides, and taking a leap of faith over a 40ft foot jaw dropping rappel. Rise with the sun to meet your guide in the Home of the World's Oldest Continuous Rodeo, Payson, AZ for a 7AM start time. Your six-hour canyon tour begins with an easy drive along the Mogollon Rim with high country mountain views all around. Keep your eyes open for antelope, elk, deer, bighorn sheep, mountain lion, turkey, black bear, or the newly re-introduced Mexican gray wolf. Buckle on your helmet and bow your head, praying for a fun filled day full of fellowship and safe adventures. Leaving the van behind to head out cross-country, you will be navigating your way through a pine tree forest. Once in the canyon bottom your swimming and rock hopping skills will be tested. 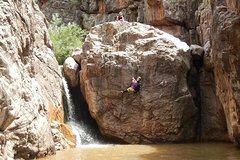 The route continues to become more adventurous as slides, waterfalls, down climbs create fun obstacles to decipher. At times the best way may be sliding, jumping, being lowered, or rappelling to continue the journey. The adventure culminates as your group reaches the edge of a waterfall. With no where to go, but down, everyone gears up for a thrilling rappel into the deep pool below. The adventure is not over yet though as more full body exercise continues until the trip abruptly leaves the water behind and cuts out cross country once more. Your hard work is done as you pile into the shuttle vehicle. Enjoy the smooth drive back into civilization, exhausted and happy en-route to Payson.